Although it may have a number of components, savvy homeowners are advised to think of their backyard in the same terms of a home—that is, a single project. What both the sales and construction teams at Blue Haven offices around the country have found, is that the ideal approach is to have a single contractor that you can rely on for your entire backyard space. They know from experience that one chef in the kitchen helps ensure a more coordinated approach and design result. A single contractor can develop an entire plan for use of travertine stone in your pool’s perimeter coping, the façade on your outdoor grill, as well as the step-stone path that leads from the deck to the play area. One contractor can do a much better job of ensuring that crews for the decking don’t run into problems or technical conflicts with the crews putting in your pool house or screen room. Expertise for each phase of construction will be ensured as well. A large, established pool builder like a local Blue Haven office has a team of experts that it has vetted and regularly draws upon for specialties such as landscape engineering and custom stonework. One contractor can also unify technology, providing automated systems that tie various backyard functions to a single remote control. For example, one device can turn on your spa jets, as well as your landscape lighting. Best of all, when it comes to using a single contractor, we hear from homeowners who absolutely love when they can pick up the phone and talk to one person about each construction phase. One point of contact makes your life easier throughout the project and ensures a more seamless, enjoyable process. 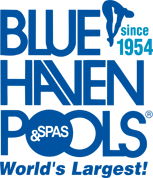 For more about transforming your backyard, contact the Blue Haven Pools office in your area. Click here for a national directory.